Snippets of Jack: "To The Fountain"
Blackbeard, the pirate all pirates fear, resurector of the dead in his spare time, is now scared to death that he is going to die. According to prophecy, he will be killed by a one-legged man and the only one of those we know of is Barbossa, the very man who Blackbeard had attacked. And when Blackbeard attacked Barbossa, Barbossa lost his leg, making him one-legged and therefore prophisized to kill Blackbeard. Ironic, right? Blackbeard is of course a master of voodo so he's all right, right? WRONG! However he does fight fate but it of course fails but it's all very entertaining. Using his voodo powers Blackbeard uses Jack to help him find the fountain of youth, which would save him and stop the prophecy. Jack: "I actually have no interest in the fountain what so ever. So if your heart is set you may drop me of anywhere you like." Blackbeard:"That'll be all quartermaster. Your words surround you like fog which makes you hard to see." Jack:"And what of you? The mighty Blackbeard, beheaded they say, still your body swam three times round your ship, and climb back on board. And here you are running scared." Blackbeard: "Scared?" Jack: "To the Fountain." Blackbeard: "The quartermaster sees things before they happen. He has foreseen my death. And so the fates have spoken, the threads of destiny woven." Jack: "You have a ridicouisly high regard for fate, mate." Blackbeard: "And you?" Jack: "Me? I'm skeptikal of predicting any future. Which includes me." Blackbeard:" It would be foolish to battle fate. But I be tempted to cheat it." Potatoe pototoe. Blackbeard: "I will reach the fountain. You will lead me." Jack then tries to stab him but apparently, "That Knife will serve you no better than the mutiny you divised." Jack: "Mutiny served me well. It gained me an audience with you." They then talk about Angelica, and how she is a mutinous first mate and Blackbeard didn't even guess it. Is it just me or is Blackbeard a bit slow? Mean while Blackbeard is playing around with Jack's little voodo doll. But then Jack goes too far about how evil Angelica is and Blackbeard takes out a knife which he uses to draw a strange symbol onto Jack's chest. Blackbeard also proves his voodoness is a match for fate later on the island that holds the fountain of youth when he is making Jack jump off a cliff to find the silver chalices. Jack: "Just as I thought. Not this way." Angelica: "This is the way isn't it?" Jack:" Of course it is, but we should go around to the east." Angelica: "That would take us out to the path of the chalices." Jack:" Then we'll circle back." Angelica: "There is no time." Jack: "Your the one who insisted on bringing the bloody mermaid." I don't think the mermaid thinks she's bloody. Angelica: "The mutiny didn't help." Jack:" You walk like a girl." Angelica:" You would know." Blackbeard: "Someone must go." Angelica:" You mean split up." Jack: "You mean jump? This I cannot wait to see." Blackbeard: "Sparrow will go. Find the ship, retrieve the chalices." Angelica: "Sparrow? What makes you think he will come back." 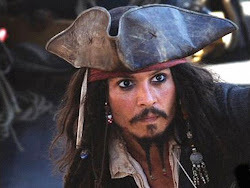 I for one think Jack Sparrow is 100% trustworthy, since he's, ya know, dishonest and all. Jack: "Yes. What makes you think he will come back?" Angelica: "We cannot trust him, father I'll go." Jack: "She'll go." Angelica then tries to jump of but Blackbeard stops her. Way to ruin the fun, Blackbeard! Blackbeard: "How much farther to the fountain? I'm running out of time." Jack: "About a day's march north following that river which will lead through a series of pools. Then you're close." Blackbeard tries to take Jacks Compass. Blackbeard: "You will go." Jack: "I was sure it would come to this. You that feeling you get sometimes when you're standing in a high place? Sudden urge to jump. . . I don't have it." Blackbeard: "I need those chalices." Jack: "Shoot. Save me the bother of the fall." Blackbeard: "You will go. You will return. . . Or I will kill her [ points gun at Angelica]" Jack: "You won't kill your own daughter." Then Black beard prepares six pistals, with four of them loaded. He then has Jack pick which two to Blackbeard will shoot her with. That way Blackbeard proves that he is willing to kill his daughter. Jack doesn't want Angelica to get hurt, but he also doesn't want himself to get hurt so he asks the quartermaster if he'll survive the jump. The quartermaster asks for the Jack's doll and throws it off the cliff. the doll survives the fall so it looks like Blackbeard has powerful voodo powers, Angelica is safe, and Jack is safe. So Isuppose this is a good time tosay," All's well that ends well."